« Day 19 and 20 – Portomarin and the Homestretch! Day 21 – Palas de Rei and 3 More Days! Today was different. 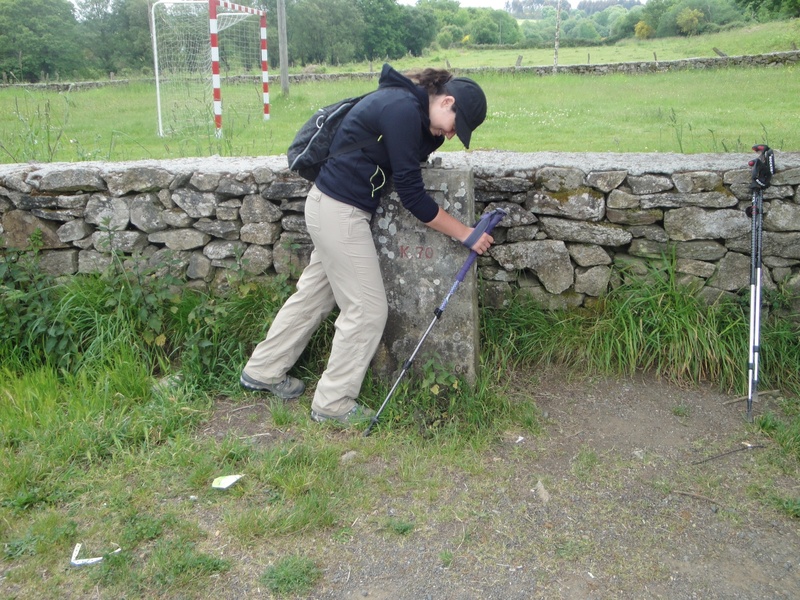 It is not a myth regarding the swelling of people on the Camino after leaving Sarria. The endless pods of 6 to 12 people in nice clothes, “day shoes”, women wearing jewelry, people looking so fresh, energetic, lively ……… but walking ever so slow and walking like they’re just out for a Sunday morning walk in the park. And then I saw something I didn’t realize existed on the Camino. SAG wagons. I don’t know if SAG is an acronym, it may be. It’s a term I learned taking part in some cycling events in Colorado. SAG wagons are the support vehicles for cyclists that provide support equipment for the cyclists. The Germans call these “broom” wagons. Good description. Anyway, there are large groups of people walking the Camino from Sarria in which they’re LUGGAGE is transported to their next hotel and when they stop for breaks, there’s a bus with snacks for them. These people basically have SAG wagons. I know how I agonized over using a bus one day for about 20 kilometers to save our legs before heading into the mountains. I felt like I was breaking some kind of Camino code. Since we passed Sarria I’m being reminded everyday that each of us must experience our own Camino. Judging how others are experiencing their own Camino if different than one’s own conflicts with the Camino spirit. This is two days in a row I’ve brought up this topic. I should really let it go! I see a very valuable lesson in this for me. This is a topic I really need to reflect on and learn from. Today’s walk was very ordinary in a lot of ways. I didn’t stop to take too many pictures today. My blisters were making their presence known, my feet were barking at me most of the day, my left knee was tweaking now and then forcing me into a limp from time to time. Hey, what should I expect? I’m 60 years old and it’s been 21 days since we left Burgos. We haven’t taken a rest day since we left Leon more than 2 weeks ago. Heike’s feet and blisters and not doing any better but she keeps powering forward to remain in the “Champions League.” Andrea and Nancy seem to be doing really well all considering. I think shipping their backpacks forward each day is making a huge difference for them. I don’t think Nancy’s knees could have done so well bearing the weight of her backpacks each day. I can attest that the one day I didn’t carry my backpack (26 kilometer walk up and down a mountain) I felt like I was naked. Yesterday, we met a young English Oxford student, Charlie, on the Camino who not only had a really big backpack but was also carrying a guitar case. He started in Santander doing the northern route. That’s about a 500 kilometer walk. He decided to head south and take the Camino Frances. Anyway, today we saw Charlie at a resting stop bar/restaurant. The Camino has ended for him since he said that he “blew out” his knee this morning. He was waiting for a taxi to come pick him up and send him to an airport so that he could return to England. His attitude was very positive and said that once his knee is repaired he hopes to do the Camino again but to finish this time. His attitude was so positive! Charlie brought home to me the fact that not one single day is every promised to us. We hope and pray to get to Santiago this Sunday but that is not a given. As we entered Palas de Rei, an elderly man told Andrea that she must go into the Church because he had something important for her. The four of us walked into this Church and it was very old and the altar very beautiful. As it turns out, the old man had a stamp for our Credencial. He then told us to put money in the little bowl he had on his desk! I think we got hustled by an elderly, zealous volunteer at this church! At least it was a cool stamp to put on our Credencial! We’re less than 70 kilometers from Santiago. It’s supposed to rain tomorrow all day. Not a problem, we’re now Camino veterans with only three days to go! 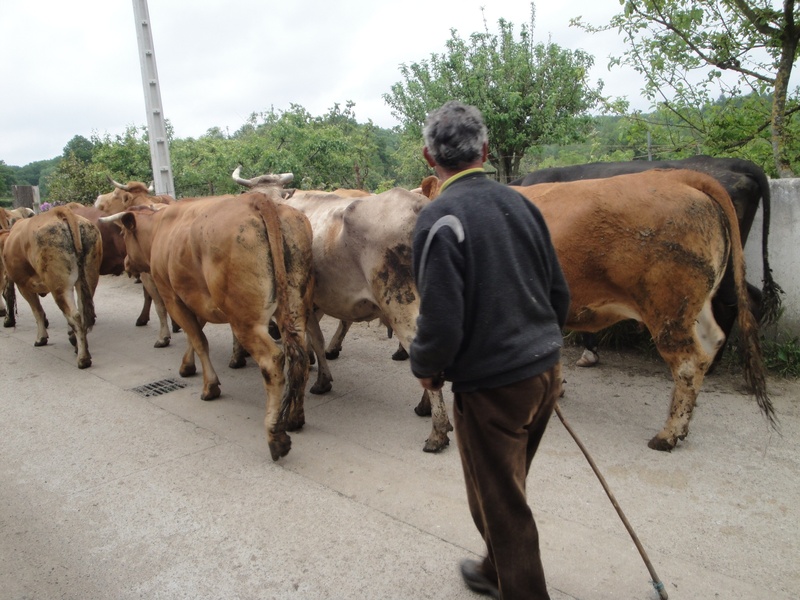 A Galician dairy man walking his cattle on the Camino. 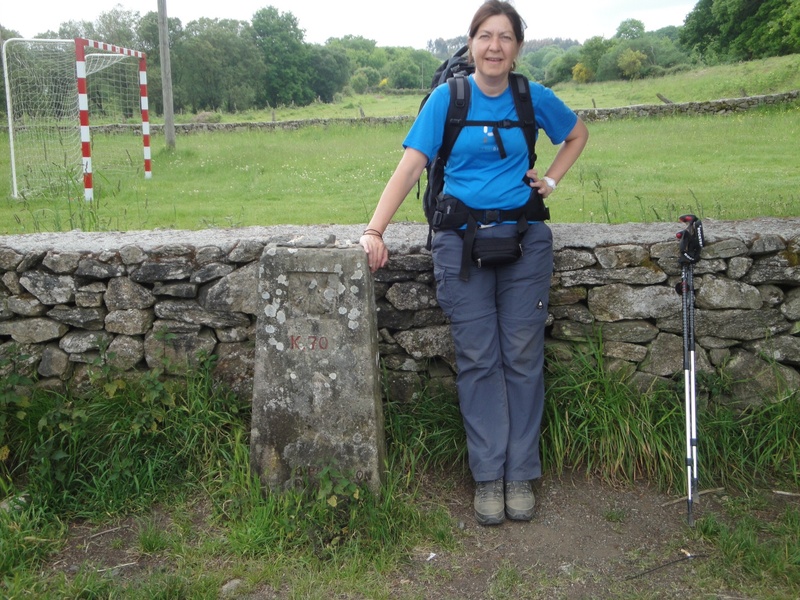 Heike at the 70 kilometer marker to Santiago. That’s like walking from Aachen to Koeln. 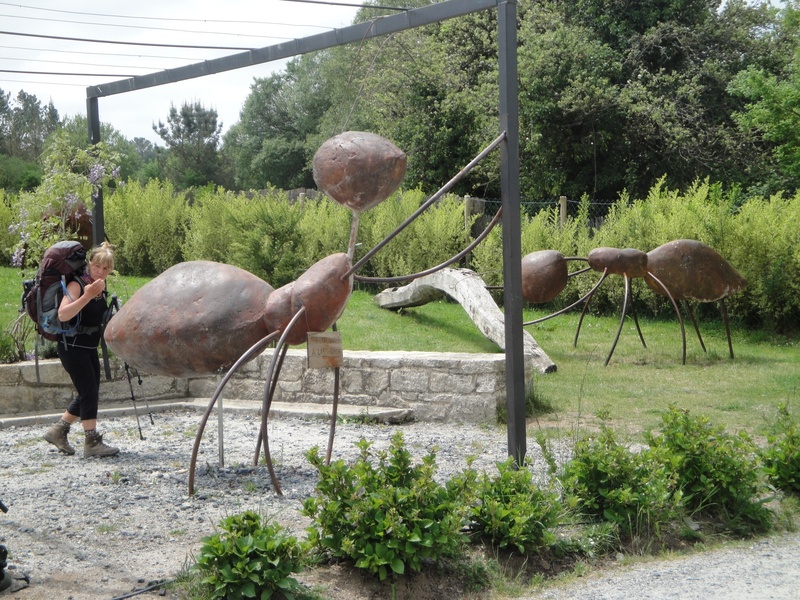 The ants are really big in rural Spain. 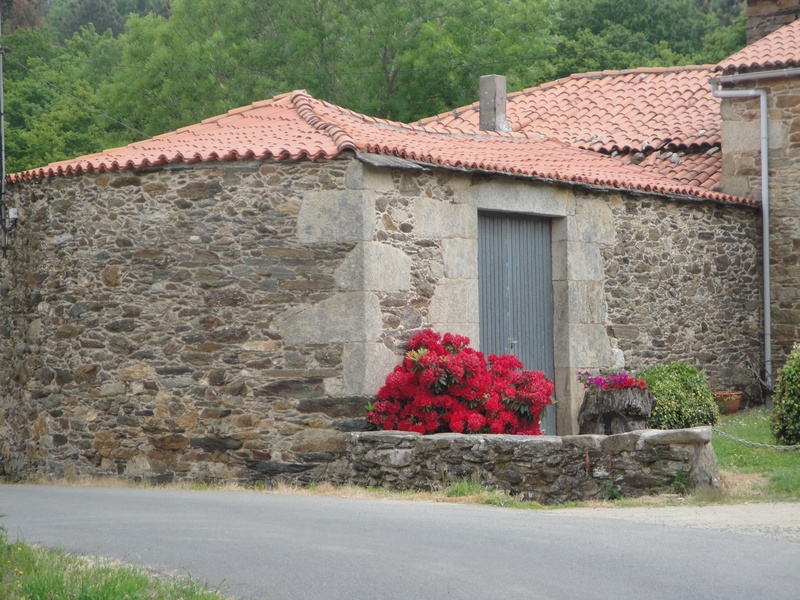 Galician home in the country. You are almost there. Andrea is right. I react the same way when I get myself into unwanted situations. I try not to ponder much but keep on going to the end. You will have accomplished something you wanted for a long time. Praying for you each day and looking forward to see you. Thank you for your prayers and well wishes. We look forward to seeing you and Lidia when we return to Denver. Sounds like you guys are having the time of your life! Joe your blogs are great, pictures epic. I can’t wait for our trip in September. We will have to throw a few back when you return to celebrate. Joe, I really do like your blogs and look forward to reading the next adventure as you discover it. What a great way to start your retirement. Great hearing from you and I’m really happy you’re enjoying the blogs. I feel fortunate to be able to share some of our experiences.mI look forward to throwing a few when we return to Colorado. You are going to have a great Camino experience this September.